Back in the mid 1980s the world was a very different place. Communication was archaic, with no mobile phones and emails bothering you every 30 seconds with an annoying ping or beep. But seeing a frustrated businessman in a public phone box recently smashing the phone down and looking very hacked off jogged my memory about a funny story involving me, Metallica, mega-manager Peter Mensch and a public phone box! I was working for Kerrang! in September of 1984 and had (rightly) identified Bay Area frashers Metallica as something special. Mensch had phoned me up to ask me exactly what I thought of Lars and Co. I replied that I thought they were gonna be The Next Big Thing. Mensch wanted to get hold of the band urgently, and wondered if I knew how to do it. I told him that the only phone number I had was for Kirk Hammett's mother, Chefela. Metallica were always impossible to get hold of because they were forever rehearsing in their garage at the back of the legendary Metallipad on 3132, Carlson Boulevard, El Cerrito, California so weren’t near a phone and wouldn’t have been able to hear it even if they had been. Once I’d hung up on Mensch, I immediately phoned Chefela. No answer, just that annoying ringing tone you get when you dial the States. I kept trying over the next several hours without any joy. Just as I was about to give up Chefela finally picked up. I explained to her that this very important guy, Peter Mensch, was desperately trying to get hold of Metallica because he was interested in managing the band. Chefela said she’d get her other son, Rick, to whizz round to 3132 Carlson Boulevard on his skateboard and tell the band straight away. About an hour later my home phone rang. On the end of the line was an international operator asking if I’d accept a reverse charge call from a public phone box in Northern California. I agreed, and could suddenly hear loud giggling in the background. Suddenly Lars Ulrich pipes up. “Hey, X-avier, how's it going? What's all this about Peter Mensch wanting to manage us?” I told Lars about the conversation I'd had with Mensch and that he was desperate to talk to them ASAP. I told Lars it would probably be best if I got Mensch to call them back in the phone box they were in. This was urgent! I repeatedly asked Lars for the number Mensch should call back on. But the line was flaky and Lars sounded like he was in an echo chamber! He finally got the long number right, running up my home phone bill all the while! I immediately got back on the blower to Mensch and gave him the number. 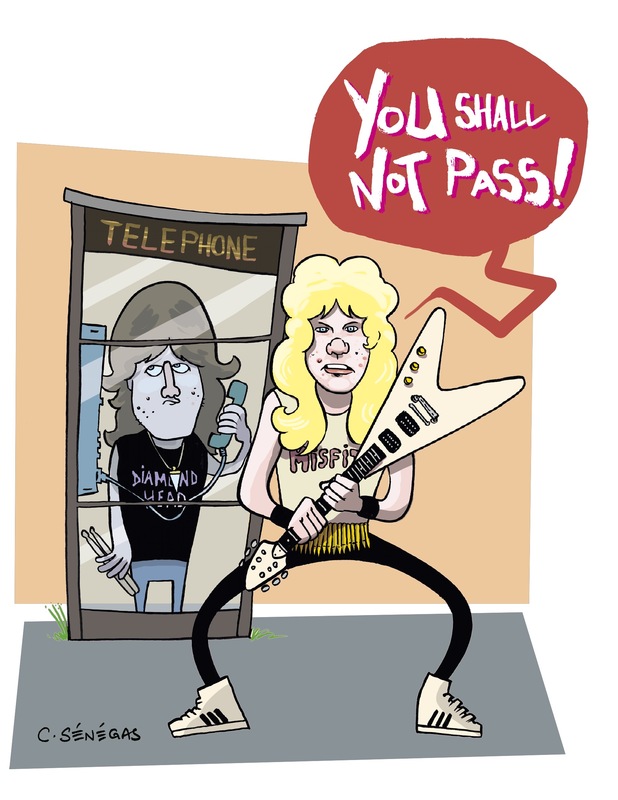 “Somebody, really needed to use the phone, so we had to let them”, said Lars apologetically. I told Lars to get James Hetfield to stick his foot in the door of the phone box and not let anyone in until Mensch had spoken to them. Lars agreed and hung up, I got back on the phone to Peter Mensch... and the rest is history! Metallica agreed to be managed by Peter Mensch and by 1991 were the biggest band on the planet, all thanks to a public phone box in Northern California and a large phone bill paid by yours truly!